Sonoma State University sports update, Oct. 26-Nov. 1. 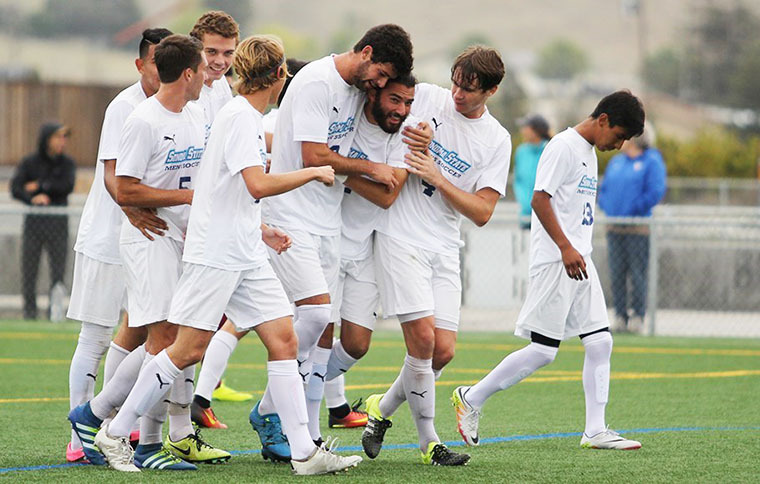 Men's soccer clinches CCAA playoff spot; women's soccer clinches the No. 2 seed in CCAA Tournament; women's golf ends fall season placing second in the Cal State San Marcos Fall Classic; women's volleyball earns a spot in CCAA Tournament; men's tennis ends season; women's basketball preseason begins. Just two minutes into overtime, Andrew Ogilvy fought off a defender and headed a loose ball up and over the goalkeeper and into the net, sending the Sonoma State men's soccer team into a wild on-field celebration after a thrilling 3-2 win over Cal State L.A. With the win, the Seawolves secured a first-round bye and the No. 2 seed in next week's CCAA Tournament in Turlock. The Seawolves (9-3-5 overall) finished second in the CCAA standings with an 8-2-2 mark in league. Daniel Theobald came off the bench to score twice and Alek Cucuk buried one in the back of the net as well, lifting the Sonoma State men's soccer team to a 3-0 victory over Cal State Dominguez Hills on October 27. With the win, the Seawolves (8-3-5 overall, 7-2-2 CCAA) clinched one of six spots in the CCAA Tournament. Haley Whitbeck and Erin Martens turned in a pair of six-over-par 150's to tie for sixth place and Sabrina Virtusio tied for ninth as the Sonoma State women's golf team ends their fall season after placing second out of 13 teams at the San Marcos State Fall Classic on October 28-29 at the Twin Oaks Golf Course in San Marcos. Courtney Shoda came off the bench and scored twice and Alex Sifuentes added another, as the Sonoma State women's soccer team will cruise into the postseason after a 3-0 victory over visiting Cal State L.A. on October 29. Allison Hadidian's made four saves during the match securing her 33rd career win as the SSU goalkeeper. Hadidian now holds the record of most wins in the history of the Sonoma State women's soccer program as a goalkeeper; she is now 33-9-3 in 50 career games. The Sonoma State women's soccer team cruised past visiting Cal State Dominguez Hills 3-0 on October 27 and in the process, clinched the No. 2 seed and a first-round bye in next week's CCAA Tournament in Turlock. The No. 20 Seawolves also jumped up one spot in this week's official NCAA Division II West Region Poll to the No. 3 spot. Sonoma State's junior setter, Courtney Seda, was named California Collegiate Athletic Association (CCAA) Volleyball Player of the Week for the week of Oct. 24-30. It was announced by the conference on November 1. This is her first CCAA Player of the Week honor. In Sonoma's matches last weekend against Cal State Stanislaus and Chico State, she dished out 92 assists to average 13.1 assists per set, and helped the Seawolves to a .248 team hitting percentage. The Seawolves swept the Chico State Wildcats at Chico in three sets. With the sweep, the Seawolves clinched a CCAA playoff spot. The Seawolves improve their record to 10-4 in the CCAA and 12-9 overall and sit second in the CCAA North Division. The Seawolves won their fifth straight match by defeating Cal State Stanislaus in four sets. Sonoma State is now 11-9 overall and 9-4 in the CCAA. Caiti Wiesner and Courtney Seda had great performances on the night. Wiesner accumulated 18 kills and Seda made 51 assists of the team's 59 kills. The Sonoma State men's tennis team wrapped up its fall tournament season on October 29 at the Saint Mary's Fall Invitational in Moraga. Originally a three-day event, rain in the forecast pushed all of the action into one day. The Seawolves went 3-11 in singles action as Allan Lock, Mitchel Heckmann and Sullivan Roche all earned victories over NCAA Division I opponents. Highlighting doubles play, Dylan King partnered with Robert Seby of Santa Clara to win the Flight G finals over fellow SSU teammates Heckmann and Kevin To, 6-3. Sonoma State Women's Basketball opened its 2016-2017 season with an exhibition game against San Jose State University on November 1. The Seawolves lost to the Spartans 105-71.